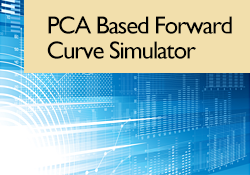 PCA Based Forward Curve Simulator | SciComp Inc.
SciComp’s PCA Based Forward Curve Simulator is a ready-to-use simulator that projects forward curves for a single asset via the widely described method of principal component analysis (PCA). Applied to the covariance matrix of historical forward price returns, PCA is used to reduce dimensionality to a user-determined number of principal components and stochastic drivers. Using these components the model simulates an ensemble of forward curves at a set of horizons T1, T2, ..., Tn forward from a given curve date. Seasonality is accommodated by segregation of input data into user-defined 'seasons.' The number of seasons in each year and the boundaries between seasons are arbitrary. PCA is performed on each season’s data independently. Several methods of filtering peri-expiration are provided for smoothing input data. Users may choose the number of factors, paths, pseudo or quasi-random simulation, and forward horizons. Quality of fit diagnostics are provided including verification that the average of simulated curves matches the initial forward curve and the distribution function of the simulated forward prices. Correlation matrices and PCA factors for each season are also exposed for user inspection and analysis. 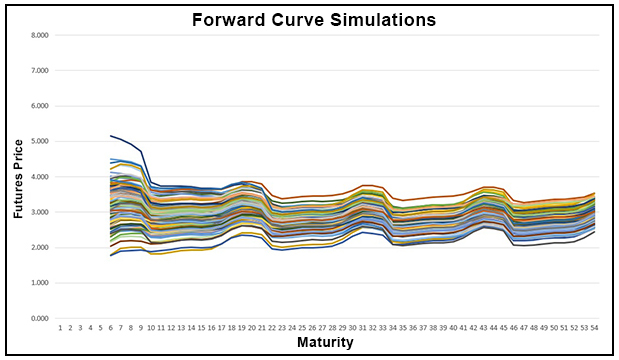 The simulated forward curve ensembles have application in pricing and risk management of financial derivative contracts sensitive to futures curve evolution and in evaluation of associated trading strategies. Need more information on the PCA Based Forward Curve Simulator?